In this post, I highlight 11 things that you should consider before choosing a course platform to host your online courses. I chose to focus on Udemy and Teachable because I have used both platforms, however, you could use this list when evaluating any online course platform. 10) Drip content (releasing content over time). After doing a ton of research on online course platforms, the two platforms that really stood out to me were Udemy and Teachable. Both of these online course platforms have been around for years and have millions of users. However, these two platforms represent two drastically different course selling and marketing strategies, so if you are just getting started and are trying to decide between these two platforms, I hope this review will be helpful to you. When it comes to getting new students into your courses (WITHOUT marketing), Udemy is the clear winner. At the time of this post, Udemy has over 9 million students registered on it’s platform. It’s a very active online learning community and the majority of course sales that I've made on the platform have come from organic traffic coming to the site. In other words, I didn't have to do any marketing or advertising to acquire new students on Udemy. Teachable is an online course platform that you can use to create and sell your courses. You can upload your course content and they’ll take care of processing sales and refunds (which is great.) But they don’t have a built in user base or accessible student community like Udemy does. Udemy will promote your courses to their vast community of students via email and onsite promotions. Teachable will not promote your courses for you. If you are going to use Teachable, you are going to have to do your own marketing to get students in the door. If you're not sure where to get started with marketing your course, check out this bonus bundle that Teachable is giving away right now. If you are just getting started, these trainings will be invaluable to you. I've worked through their "Profitable Teacher" course and it was really helpful when I was trying to figure out how to actually earn a living with my courses. If marketing just isn’t your thing, Udemy might be a better fit for you. If you already have an audience/ social media reach, or you're willing to do your own marketing (which I highly recommend) Teachable might be the best bet. 50% to instructor when a student buys a course organically through Udemy. 97% to instructor if a student buys through an instructor’s coupon code or self promoted link. 25% to instructor is sale is made through Udemy’s ad program. If you are relying on Udemy to promote your course for you, you are only going to receive 25%-50% of the sale price of your course. 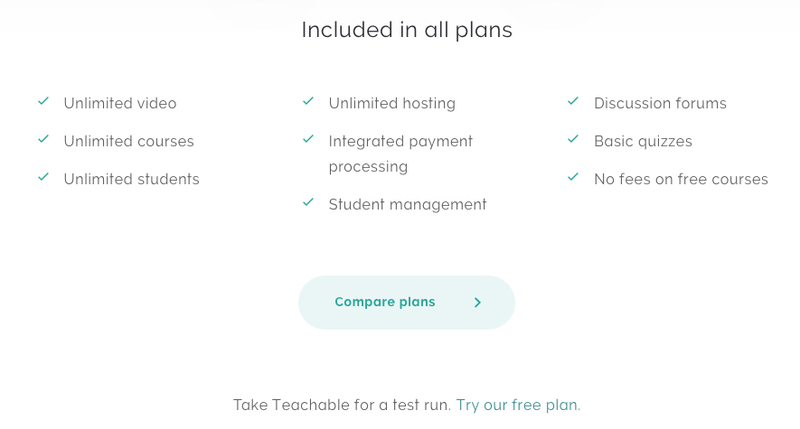 Teachable has several pricing options. You can get started on the platform for free if you like (you just need to scroll down a bit to find the free signup link), but there are several pricing tiers to choose from that give you access to more advanced features and lower transaction fees. If you choose purchase an annual plan, you get a discount. For example, if you pay for 12 months of the Basic plan upfront, the cost drops to $33.25 per month. The price for the Professional plan drops to 83.25 per month for a savings of $189 per year. There are other features that come with each tier, but I wanted to give you a clear view of the pricing differences between the two platforms. In the early days of Udemy you could sell your courses anywhere between $9 and $300 dollars. I was okay with that price range since most of my starter courses were shorter and lower priced. On April 4, 2016, Udemy announced there would a mandatory price restriction on all courses. The new range was $20 to $50. Several months later, they changed their pricing structure again. Currently, all Udemy courses must be priced between $20 and $200 dollars. There are plenty of reasons why this is a good thing for Udemy. They’ve had a major problem with discounting and price confusion in the past. You can read about that here. But the constant restrictions and changes feel very limiting to me as a business owner. Teachable does NOT have any course pricing restrictions. You have the freedom to price your courses and run your business however you want to. If you sign up for Teachable's Professional plan, you can set up direct payments through Paypal and Stipe. This means that you get access to your course revenue immediately and you don't have to pay additional transaction fees. If you are on Teachable's free or Basic plan, all payments are made through Teachable's checkout system. Teachable holds your funds for 30 days (to cover any refund requests) and pays you once a month. There's also $1+10% transaction fee on courses sold from the free plan, and flat 5% transaction fee for courses sold from the Basic plan. The important thing to remember when teaching on Udemy is that your students are NOT actually YOUR students. They're Udemy’s students and there are strict rules for how you are allowed to communicate with them. Udemy does not give you access to your students’ email addresses and you are limited in the number of messages you are you allowed to send each month through the Udemy platform. You can read the rules here and here, but they are designed to keep Udemy’s students within Udemy. Teachable actually helps you grow your student base. When a student enrolls in one of your Teachable courses, they save the student's name and email address for you. It's all saved within the platform and you can export the information at any time. Teachable also integrates with dozens of email providers like ConvertKit, so it's easy to save and organize student contact information. Udemy has a ton of technical requirements for their courses. To be fair, many of these requirements are there to ensure that people aren’t uploading junk to the site. Here’s their course quality checklist. I actually found this checklist to be really helpful for planing and structuring the content of my first course. But a word of warning to new course creators- make sure your video export settings are spot on with Udemy’s requirements otherwise they’ll send your course back to you to fix. Teachable doesn’t have an approval process for courses. You are free to use a combination of video, audio, quizzes, images, and text based documents (PDF, Word, Excel) to create your course anyway that you like. Udemy let’s you insert tracking code for Google Analytics and Google Adwords. This is great if you’re trying to figure out conversion rates, see how many people have visited your course landing page, or judge the success of a Google Adwords campaign that you’re running to your course. But that’s the extent of the integrations that Udemy allows. Teachable, on the other hand, has a ton of integration options. Need to add your Facebook Pixel to your course landing page? No problem. Want to automatically import your students into your contact management system -- you can set that up within Teachable. Want to connect dozens of third party apps with Zapier? The possibilities are almost endless with Teachable. Both Udemy and Teachable do not require advanced technical skills. Udemy is fairly intuitive to use. You pretty much “fill in a blank here” and “upload your video here” and your ready to go. They also have a lot of documentation to help you out if you get stuck and a very helpful Facebook group called the “Udemy Studio” where you can ask questions, get feedback on videos and chat with other Udemy instructors. Teachable is very easy to get started with and I got the hang of it's basic functions very quickly, mostly because of the helpful free webinars and summits that they offer. Teachable also has an amazing Facebook Community called “The Teachable Tribe.” It’s a great resource for asking questions, getting help, and networking with other Teachable instructors. 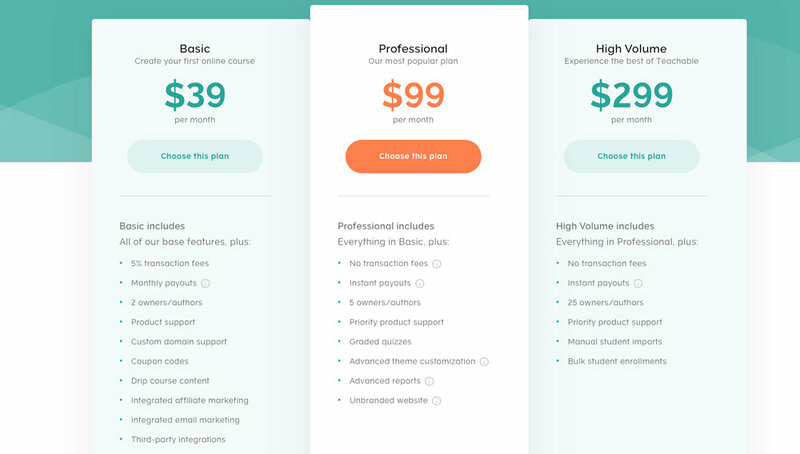 Finally, one of the big standout features of Teachable is the ability to pre-sell courses and offer different pricing plans. The ability to pre-sell allows you to validate course concepts quickly and pivot where necessary to make sure that you are creating something that your students actually want to buy. If you plan to offer premium priced courses, the ability to offer an installment plan can help you enroll more students who can't afford to pay the full price of the course upfront. A third option that Teachable supports is monthly subscriptions. This gives you the ability to turn Teachable into a full fledged membership site to earn recurring monthly revenue from students to subscribe to your courses. Udemy does not offer any of these features. 2. You want to pre-sell your course to validate your idea. Dripping content allows you to create lessons over time, rather than have your course completed before you open course enrollment. 3. You want to run a time limited free Challenge to create buzz for your upcoming course launch. You can learn more about Teachable's Drip content feature here. Udemy does not support drip content. When I first wrote this post, neither Udemy or Teachable provided much instructor training or support, but I’m happy to report that times are changing! Teachable has a vested interest in the success of the instructors who use their service. They recently rolled out “Teachable U” which provides valuable courses and resources to creators who might lack all of the skills and knowledge to create and sell their courses. They also offer weekly training webinars as well as educational summits and free virtual workshops. WHICH PLATFORM DID I ULTIMATELY CHOOSE? I use both of them, but in different ways. Udemy is great for validating course concepts. The students on Udemy are great at giving feedback which is essential for improving your course content, presentation quality, and online teaching skills. By creating a short free or low cost beta course, you can get feedback from real students that you can use to create a more premium course offering. Teachable is what I use to run my online course business. This is where I house all of my paid/premium courses. This platform gives me the greatest amount of control over my course content, pricing, student communications, and payment gateways. Download my free 25-page “fill in the blank” style workbook and start creating your profitable online course now.